Instead of the thick eyeliner and bright saris she wears for performances, Anjal Chande is dressed in capri pants and a sleeveless blouse. The petite 26-year-old plops down on the marley practice floor at her Ukrainian Village storefront studio, [node:31634 link=Soham Dance Space;], to tell me about her big plans. She wants to bring a dance style non-Indians often have trouble pronouncing to a broader audience and to help it evolve. 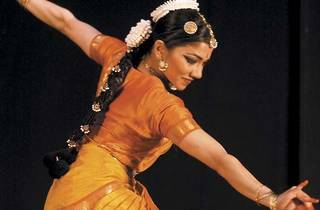 Since the age of seven, Chande has studied Bharatanatyam, a classical Indian dance form defined by rhythmic footwork, codified hand gestures and subtle, specific facial expressions. When she began focusing on her own work four years ago, she noticed performance opportunities were often confined to culturally specific festivals. This sandboxing sells the art form short, she says, and suggests a monolithic, static Indian culture. Visions of what Indian dance really is—and what it could be—are stunted. Her choreography lengthens poses, reroutes gestures, breaks apart steps and reorganizes them, although these innovations aren’t always noticeable to casual observers. What is obvious is that she eschews story lines drawn from Indian mythology and epics such as the Ramayana and Mahabharata in favor of exploring themes such as empowerment, independence, happiness and human potential. “Joining Hands,” opening Friday 19 at the [node:233705 link=Vittum Theater;], is the latest project to further Chande’s mission. The yearlong collaboration with Colorado musicians the Aakash Mittal Quartet began when Chande was introduced to their music in early 2009 by Mittal’s cousin, Gaurav Venkateswar, who lived in Chicago at the time. When she called Mittal to ask permission to choreograph a piece to one of his songs, they bonded over a shared distaste for the word fusion. It’s dated shorthand for mining traditions for inspiration, Mittal says by phone from Boulder, without first making the effort to learn their histories. Mittal describes his quartet’s sound much like Chande describes her choreography, as “a new vocabulary.” He references jazz, 20th-century composers such as Arnold Schoenberg and North Indian raga music. The quartet had never worked with a dancer before, which generated both thrills and frustrations, he says. Writing music to accompany dances Chande had already choreographed was a new experience, as is one section that Chande improvises for each performance. He tells me that creating tradition-referencing music without traditional instruments generated the most trials and errors. Chande and the Aakash Mittal Quartet join hands and forces at the Vittum Theater Friday 19 through Sunday 21.